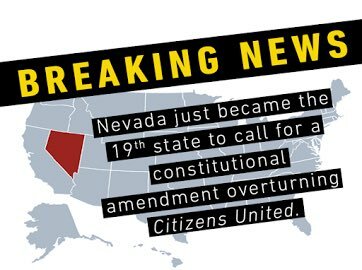 Update from Nevada back off Common Cause. TYT - What Are "Democracy Vouchers?" Twenty-seven times in our country’s history amendments have been made to the U.S. Constitution. They’re often made to address issues that weren’t foreseen by the Founding Fathers as they were writing the original document. Michigan Gov. Rick Snyder (R) has signed new legislation that will allow candidates running for state office to raise unlimited money for outside political groups, an expansion of campaign finance law likely to be seen in other states in the future. Leading figures from the right-wing alternative media are launching a political group to support candidates in contested primaries. A group of pro-Trump media figures are launching a super PAC aimed at making an impact in the 2018 midterms. I support Kevin de León in his bid to replace Dianne Feinstein. I credit him for making a real difference. He's written many of California's environmental protection renewable energy laws and regulations. He's actually awesome. So he gets my vote. You've just looked at a photo of a man who could conceivably become President of the USA someday. To actually be correct you folks need to change your posts to the truth. Which is states ran by the Democratic Party are moving to get the money that goes to Republicans out of politics. Rosie O’Donnell offered to pay Republican Senators millions if they voted against the tax cuts bill — and her critics are crying bribery.